The potential for retail partnerships with Niantic's Pokémon GO mobile game is built right into its central hook - players travel to real-world locations to catch monsters and collect items, so why not steer them to participating stores or restaurants for a little synergistic profiteering? Ubiquitous coffee house Starbucks seems to be the first business taking Niantic up on a partnership. Internal documents detailing an upcoming promotion for employees, designated for US stores but leaked by Eurogamer, offers some sweet details for players and coffee fans alike. The documents make specific mention of an update to Pokémon GO scheduled for Thursday, December 8th. 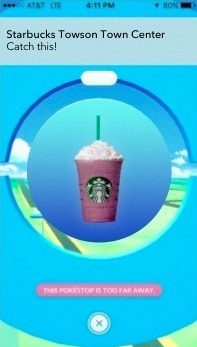 That update will designate most of the in-game locations corresponding to US Starbucks stores as either Pokestops (where players check in to receive Pokeballs and other items) or Pokémon gyms (where players fight each other's monsters and claim territory). 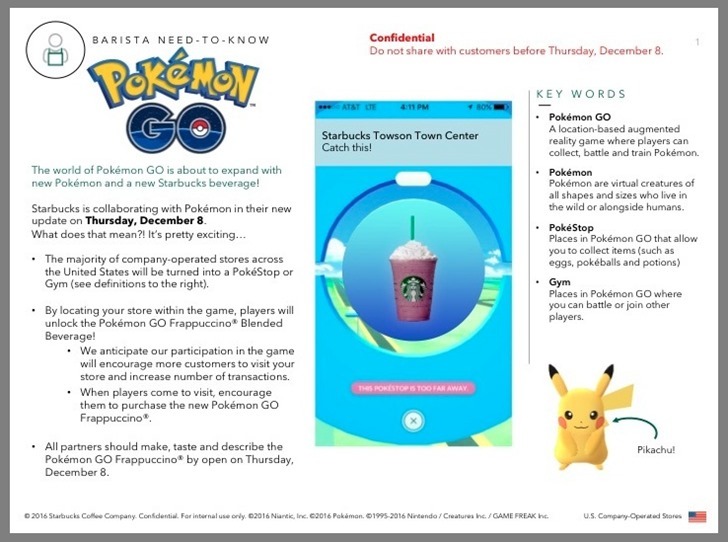 There doesn't seem to be any criteria for which stores will be stops and gyms and which ones won't, but since Starbucks locations are usually chosen for high foot traffic anyway, it probably won't be a major change for players. The more interesting detail is that the update will bring "new Pokémon." No further information on this point was offered. Currently Pokémon GO players can catch almost all of the original 151 monsters from the first round of Game Boy games released almost 20 years ago, with the exception of a few ultra-rare creatures. The only ones that can't be caught or evolved so far are the original legendries: Mew, Mewtwo, Articuno, Zapdos, and Moltres. Either the new Pokémon is one of these five highly anticipated creatures... or Niantic is going to add monsters from the second-generation games, Pokémon Gold and Silver. (This has been rumored, but not confirmed, for some time.) If the latter turns out to be true, we could be looking at as many as 100 new creatures to find and evolve in augmented reality, to say nothing of potential new features in the game itself. With special events, daily bonuses, and an endless series of tweaks to the core game, Niantic has been slowly winning back players after the initial boom and letdown this summer. Bringing back the tracker in a modified form was a big boon. If they can add a huge new variety of creatures in time for the holidays, or even just a few highly desirable ones to hunt while traveling, it could keep the initial excitement of Pokémon GO alive and kicking well into 2017. Oh, and one more thing. The Starbucks partnership means that shoppers will have access to an official Pokémon GO Frappuccino, the store's signature smoothie-style coffee drink. 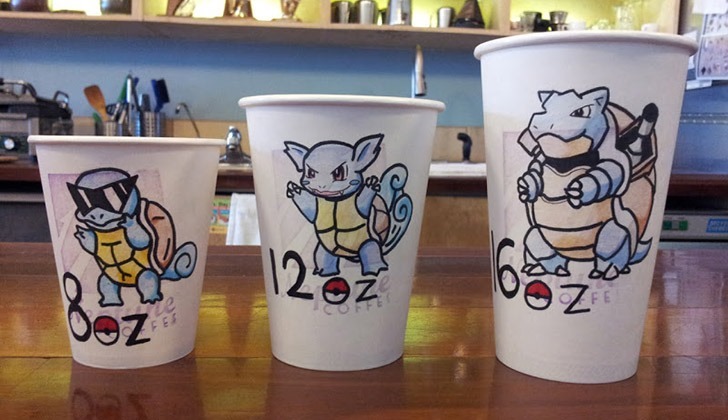 The Pokémon variety is made from a cream base with blended ice, vanilla flavoring, freeze-dried blackberries, strawberry syrup, and whipped cream on top. That makes for a drink that's, well, pink. Either Starbucks just couldn't make a yellow Pikachu drink that looked appealing, or someone has decided to make a real life Frappuccino version of the infamous Slowpoke Tail treat from the Gold and Silver games. Even the pink-and-white coloring matches. Oh, the Poke-manity!